The boys and I received bags of treats from our family in the US today (yay, thank you, family). One of the things on my wishlist was a set of large crochet hooks. I am so lucky that there’s a Michael’s store near my in-laws’ place, and so my crafty wishes are usually granted. With this batch of pasalubongs came a set of Boye hooks, sized 8.0mm, 9.0mm, 10.0mm and 11.5mm. Happy dance. My new giant hooks. Yay! Right after our lunch meetup with my sister-in-law at Buffalo’s Wings and Things / Chubby’s Rib Shack in Commercenter (which I will blog about soon, promise), I checked Ravelry for nice projects to make with my new hooks. I already had a certain project in mind, which was actually the reason why I had asked for the big hooks in the first place. I also knew that I wanted to make a rug. After a couple of hours of browsing, I finally decided on these seven as my priority projects. I just need to figure out the right yarn weight for these, coz honestly I didn’t really read through the details all that thoroughly. Lol, yes, my excitement took over. So, if any of you guys know where I can get chunky chunky yarn in Manila (or cord that’s nice to crochet with, actually, or tshirt yarn), lemme know! 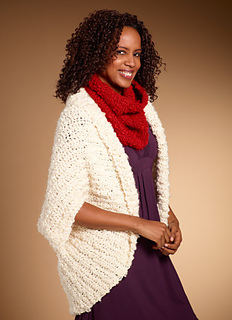 I think that I could probably get away with making this using several strands of worsted weight yarn. I don’t think I have that many skeins of the same color, so i just might multi-color it and see how things turn out. 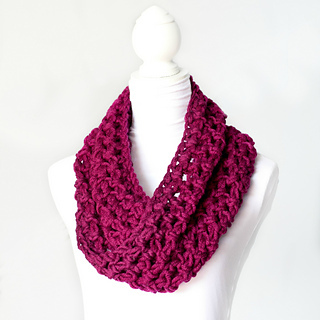 Check out the pattern for this cowl here. This was the pattern that made me want to have large crochet hooks. I actually tried making this with an 8.0mm hook, which I already had on hand. It obviously didn’t turn out as nice as it was supposed to, hence my big hook bilin. So now I’m really excited to get to work on this. I also received a nice light yellow skein of Caron One Pound, and that’s what I plan to use to make this wrap. Pattern here. 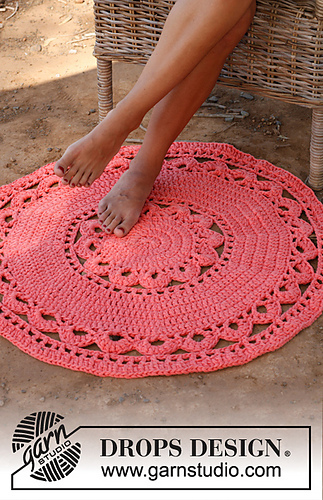 I know that it’s probably too hot to wear crocheted shrugs made out of thick yarn here in the Philippines, but I don’t care, I still want to make this. Good luck to me, though, if I can find yarn this thick. I wonder if there’s anywhere I can have some made? Pattern here. Honestly, I love the color that the pattern designer used for this scarf. So pink! Thing is, the listing on Ravelry says it needs a 10.0mm hook, but the pattern on the Crochet in Color site says I hook, which is only 5.5mm. Oh well, I will try to make this in worsted weight with one of the bigger hooks and see how it turns out. If I wanna be able to use it here, it has to be on the lace-y side anyway. 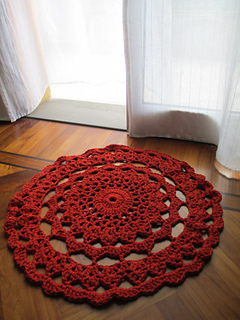 Yep, another pattern from the Crochet in Color site. I love the color used to achieve the ombre look here. I now want to lay out all of my yarns and see which would look nice together. I think maybe I’ll do that tomorrow while the boys are out hehe. Here come the rugs! I love the idea of a giant coaster-looking rug in my bathroom. I really feel that it will make the space a whole lot prettier, and you know how I like pretty things. It looks like I will need to do some experimenting with this one, though,until I get the gauge right. Get the pattern here. This pattern uses the same type of yarn as #6, so at least I only need to do one round of gauge experimentation for both. You can only get this one via Ravelry, so if you don’t have an account there yet, go and get one. And don’t forget to add me as a friend! My username there is mrspcuyugan. Not surprising, no? So there you go. I can’t wait to get to work on something new. How about you guys? What crafty things have you been working on lately? I just read earlier from another blog that you can buy from DMC it’s called zpaghetti yarns I think.. 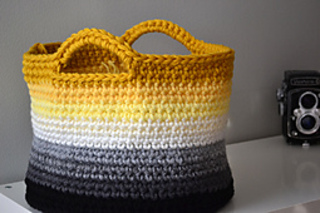 I don’t know how to crochet but I’ll take that Ombre Basket! INGGIT! I’ve been bugging my mom to teach me how to crochet but she keeps telling me na masisira lang daw eyes ko. Haha! I’m dying to learn though. I know how to do crochet but it’s been years. I want to learn how to knit! When I was a child, my mom taught me knitting but when she was going to teach me crochet, I found it too hard. I never got to learn it. 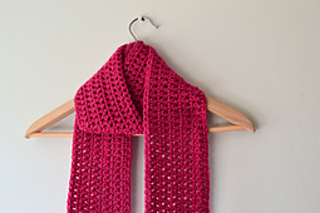 My friend Karina is selling crocheted scarves and products, too, this must be a trend now. Sige, if it turns out to be a success heehee! Why we don’t have crochet class when I was in school and crosstitch lang ang tinuro? Easy lang ba ito? It looks complicated to me. hehehe! LOVE the hooks and the Ombre Basket!!! Ok lang ba if I try to make one, too? But of course! 😀 I love you talaga, I’m so happy I have a crochet buddy. Inspired by you…working on my next crocheted bag! Will post a pic pag mukha ng bag yung ginagawa ko…kasi ngayon mukhang malaking doily!! !